Trading is a business. Like sales, trading requires the trader to brain jockey with an accumen and a model focused on a mecurial market. Learn, adapt and receive, or not. Example: Basis the front month of the e-mini $5 Dow futures, during the period of April 2010 through June 2010 (and part of July) the Stretch calculation, including the Stretch Fibonacci calculations, projected (often within a dozen points) price reversals through a variety of trading techniques starting with fading the first move. Knowing that the Technical Analysis Characteristic Reliability Index ranks equity index futures second to last in the top twenty, gives a trader the advantage of knowing that TRADING PRICE, not moving averages, or histograms, etc., improves the trader's ability to identify tradeable probabilities. In combat, learn and adapt or give your lose (your money). Trading is a business. Can you please share any more tips ? I wish I could but I worked way too hard for too many years to figure it out. It will be more rewarding for yourself if you put your brain to the grindstone. I agree. At least you have me pointed in the right direction. You could say that for some people trading is business. Look at http://www.openfutur.es/performance?quicktabs_2=second . I am convinced that most people loose money with their trading strategy. On the other hand, less people/systems make profit. The hard thing is to accept that you belong to those people who loose. Interesting results, take a look at the worst loss versus the best win that each of the top 5 traders have experienced. To me that sounds off a warning bell. Those are big losses (high risk) versus the smaller wins. Personally I'd like to see that ratio reversed to make the risk more acceptable. 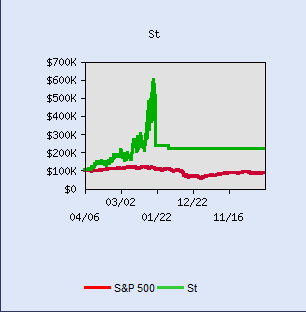 This is the same profile that we were warning traders about in the Six Sigma Trading Strategy (on Collective2) that the owner was touting on this board. This is what happened to Six Sigma in the end before it was discontinued. What caused the drawdown from 600K to 200K? Too high leverage? The major problem with trading is that it takes advantage of human emotions.Well you cannot get rid of your emotions but you can choose what actions to take.If you are a male am sure you have been to several places where you saw gorgeous gals and almost felt like kissing her instantly!! !do you ever do that.Of course not coz there are consequences set by society.what has this to do with trading.Rules must be set and must be obeyed(if you are discretionary)-the consequences are losses and because each one is trading their own account,there is no one to enforce those rules. Look when you are born there are parents to enforce the rules,then you go to school where teachers enforce the rules.Those rules hit home when you get employed with the bosses enforcing the rules and outside the police etc.What happens when you are free to enter and exit the markets freely with your own money? ?Gambling instincts kicks in. System trading? ?-you must be a large institution to profit from system trading where you are ok to sustain several periods or long periods of losses.No human can sustain 30 losses in a row and still have the nerve to trust the system. Trading is a business, and can make you a living. But it is also a haven for sharks and people who will strip you of all your worldly goods if they can. I've been at it for several years now and the best advice I would give anyone is this - you don't have to pay for anything, all the information you need is out there and for free. You don't need expensive courses, you don't need expensive seminars. I'm not going to comment further on those sources but there is a lot of information available for newbies from them, for free. Take it or leave it, a combination of what's available there works for me. Unless there is good trading strategy that you can trust which should be properly back tested on large historical data, don't venture into the trading. Also Day trading is not a long term sustainable model unless you have a automated trading strategy.